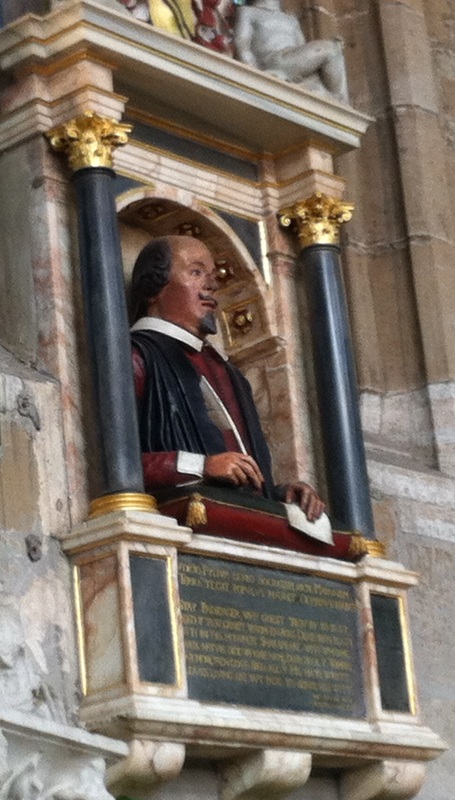 This weekend rounds up the celebrations in honour of William Shakespeare’s Birth on 23rd April 1564. I love to be in Stratford on Avon at this time to soak up the atmosphere so I set off this morning full of joy and anticipation. I was not disappointed. There were street entertainers, market stalls, a literary festival and scenes of celebration all around. And, the sun was shining gloriously. I have written about the special 400th celebration in 1964 previously so you can read about the events that take place in that post. But today I would just like to share some of my photos with you. The river Avon is always a joy to walk beside and today the boaters were out in force. The walk to Holy Trinity Church where Shakespeare and some of his family are buried was beautiful. On one side is the river, and on the other, blossom trees and wisteria covered houses. 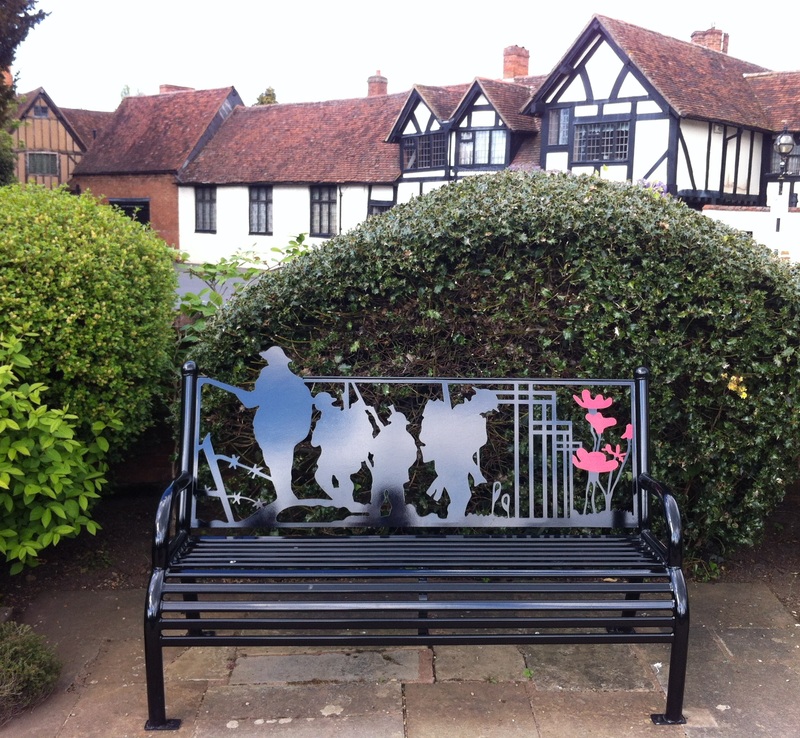 I took a detour through the pretty little garden in memory of those who died in the two world wars. It is a most peaceful place in the older part of town. When I got to the church it was surprisingly quiet as the crowds had left. 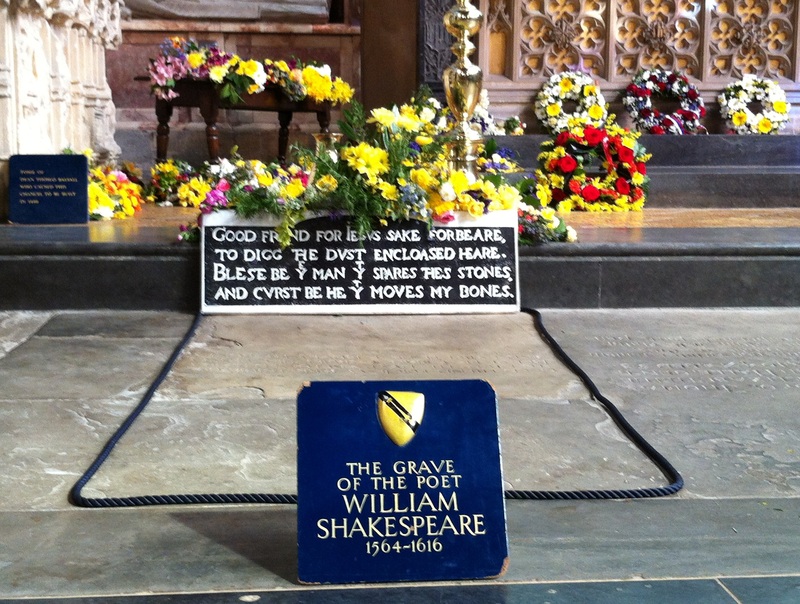 I was able to wander freely and take in the amazing aroma of the masses of Spring flowers which had been laid in the Sacristy all around Shakespeare’s grave. On the way back from the church we passed The Other Place and various workspaces belonging to the Royal Shakespeare Theatre and of course the theatre itself. I took my photo from the gardens behind the theatre as that is where I used to sit on the grass and do my homework when i was a schoolgirl in Stratford many years ago. After this I wandered through the Bancroft Gardens to enjoy the live music and to see the Gower memorial. This famous memorial was originally outside the theatre but when the theatre was destroyed by fire in 1926, it was decided to move it to its present position overlooking the canal basin. It certainly is a superb position. On the top of the memorial is Shakespeare himself and around the base are main characters from the plays. There is Falstaff, Lady Macbeth, Prince Hal and Hamlet. In the Bancroft Gardens there is a fascinating flower bed filled with plants that are mentioned in Shakespeare’s plays. They deserve a post all on their own so I will just quickly show you the flags that lined the main streets. Ambassadors and dignitaries come from all over the world to pay their respects during the annual birthday celebrations and their flags stand proud. It was a wonderful day and I came home very happy. I am really looking forward to next year, 2016. William Shakespeare was born on 23rd April 1564 as I said and I was lucky enough to live in Stratford in 1964 when the 400th anniversary was spectacularly celebrated. He died, also on 23rd April, in 1616. So next year will be the 400th anniversary of his death at the age of 52. Great plans are afoot for commemorative events worldwide, and and as it falls on a Saturday it should be a great occasion in Stratford. It will seem strange to commemorate his birth and his death on the same day, but I hope to be there!